The dead do not always rest in peace. Occasionally, they wind up in the backyard. As towns grew in Cuyahoga County during the late 1800s, many of its cemeteries were relocated to make room for urban sprawl. But not all of these graves made the journey. Author William G. Krejci tracks down more than fifty displaced cemeteries throughout the Greater Cleveland area. 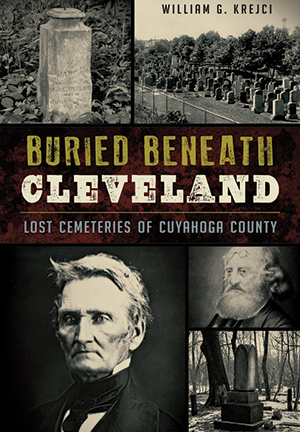 Discover the Revolutionary War veterans, famous scientists and illustrious dignitaries found beneath gas stations and grocery stores in this eerie history of Cuyahoga County's forgotten dead. William G. Krejci is a seasonal park ranger at Perry's Victory and International Peace Memorial in Put-in-Bay. Raised in the greater Cleveland area, William is also a former volunteer docent at Cleveland's Gesangeverein Hall and at Prospect Place in Trinway, Ohio. William is the author of three mystery detective novels and has been discovering and documenting historical sites in northeast Ohio for years. He studied video production, film and screenplay writing at the Art Institute of Pittsburgh.